What is the Secant-Tangent Rule? 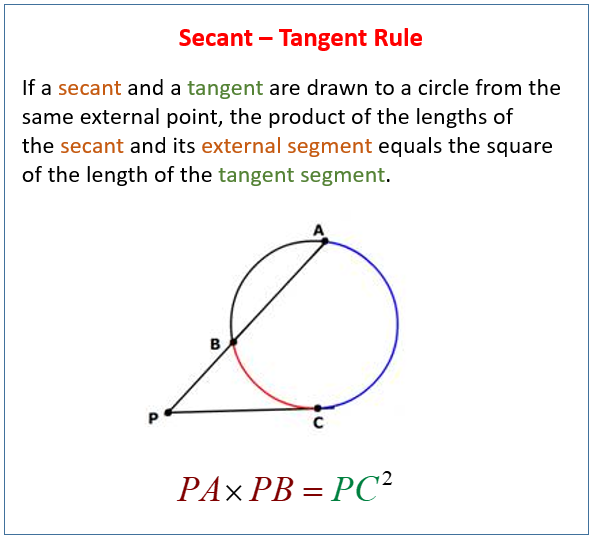 If a secant segment and tangent segment are drawn to a circle from the same external point, the product of the length of the secant segment and its external part equals the square of the length of the tangent segment. The following figures give the set operations and Venn Diagrams for complement, subset, intersect and union. Scroll down the page for more examples and solutions. The segments of a secant segment and a tangent segment which share an endpoint outside of the circle. The product of the lengths of the secant segment and its external segment equals the square of the length of the tangent segment. This video focuses on using the Tangent Secant Theorem to find the length of a tangent line segment. This video also reviews how to find the roots of a quadratic equation.